Did you know that white nails are a thing? Well, they are. I think they started showing up on the runway about 3 summers ago, so the time is about right for them to make their way here to Smalltown, USA. White polish looks great with tan summer skin and it’s also makes a perfect blank canvas for all kinds of nail art. 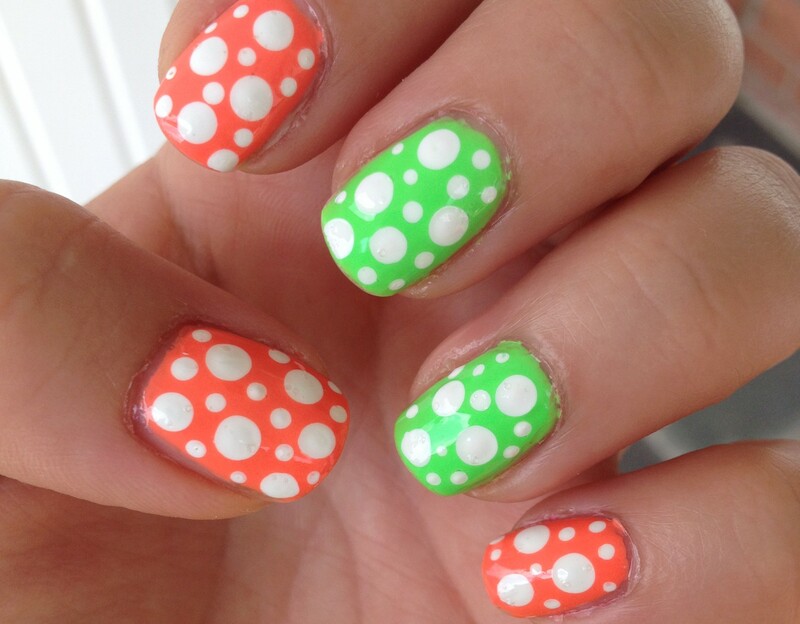 It’s also can help your sheer neon polishes look extra bright. White polish can be tricky, though. Light polishes can sometimes be sheer, and light colors seem less forgiving than darker ones when it’s not quite perfect on the nail. That’s why it’s important for every nail polish fan to own a good white polish. For years I used the Wet n Wild white because well, it was cheap and easy to find in just about any store. I felt like the formula was okay, but not great. Then one day I found Essie Blanc on a good sale! I really thought it was going to be this amazingly wonderful stuff because it was regularly 8 times more expensive than my normal Wet n Wild. Sadly, that was not the case, but it did motivate me to go on a hunt to find a really good white polish. Wet n Wild: With 2 coats, you can see that it’s still a little shear, but with 3 coats it’s pretty much opaque. Broadway Nails: Pretty similar to Wet n Wild, but maybe a bit more sheer. NYC: I think with two careful coats, this would be opaque. You can see on my middle finger near the cuticle that I had a little trouble with the polish pulling up and leaving a bald spot. Generally, that’s caused by going over the polish with the brush too many times, which causes the polish that is partially dry to pull up from the nail. I think if you are able to apply a coat of polish in 3 strokes, this polish will look good with only 2 coats. Sinful Colors: This polish looked great in 2 coats! I did a third coat on my ring finger for consistency’s sake, but it really didn’t need it. Sally Hansen: This one is my favorite! It was perfect in 2 coats, and a third coat actually made it a little too thick. Really, this is a smooth, perfect white polish. Essie Blanc: This one really preforms about the same as the Broadway Nails polish. It’s really not that great and a rip-off for the price. And do you see the teeth marks on the cap? Yeah, I had a little trouble getting it opened this one time. Anyway, I disliked this polish enough that I used it to do a little Frankenpolishing. So, in the end I really feel like the Sally Hansen polish is the bet polish of this lot, and at $3 or less, it won’t break the bank. If you can’t find the Sally Hansen or you want to save a buck, I don’t think you’ll be disappointing with the Sinful Colors polish. The other 4 polishes are just okay. They will work in a pinch, but they don’t really rock my world. Have you tried any of these polishes? What’s your favorite? Have you tried any whites that aren’t on my list?